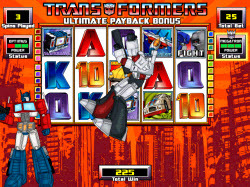 Turn yourself into a big winner with a game of “Transformer” slots. This is a five reel and twenty-five payline game inspired by the popular cartoon and movie series. The game offers a nice range of transforming bonus symbols and also very flexible wagering options. Coin values can vary from as low as one penny and all of the way up to five dollars apiece. The game includes several different kinds of wild symbols as well as a challenging bonus game on a second screen as well. The symbols used to illustrate the theme include recognizable characters like Optimus Prime, Megatron, Cybertron, Bumblebee, Jazz, Starscream, Soundwave and the A, K, Q, J, 10 and 9 icons too. 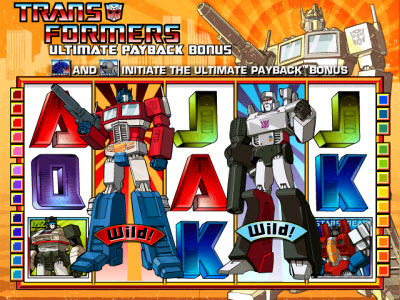 The “Transformers” slots game includes wild symbols that will transform and expand with each appearance. They are the Autobot and Decepticon images and they will substitute themselves for any other symbol except the bonus symbols. When they appear on a reel they may suddenly transform the entire thing into wild symbol and make a handful of winning combinations complete. There is also a variable wild symbol, which is the Cybertron image. It too will substitute itself for any other symbol except the bonus images, but when it does complete a combination the player is given a chance at receiving a multiplier. The Cybertron combinations ask the player to select from an assortment of planets on the screen, and their choice will reveal a multiplier from two to ten times the winnings. The bonus feature is triggered when the Optimus Prime and Megatron images appear simultaneously on reels one and five. When this happens the player is taken into a new screen where they must guess which of the two Transformers is going to win the battle. 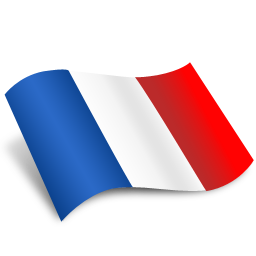 After the choice is made the player enters into the free spins period. Each time the “Fight” symbol appears on the free spins reels the two Transformers go into combat. Every time the one selected by the player gives a hit to the other the player takes in two times their original bet on the spin. 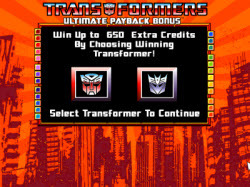 If the chosen Transformer wins the round the player gets twenty more spins, if they lose the player exits the bonus feature with six times their original bet as a reward. Any prize payments for the “Transformers” slots game are determined by the number of icons on the reels. When there are five, the prizes are two thousand coins in the amount wagered for the logo, one thousand for Bumblebee, seven hundred fifty for Jazz, five hundred for Starscream and Soundwave, two hundred for the Ace, one hundred fifty for the King or the Queen, and one hundred for the Jack or 10. When it is four symbols on the payline the prize is three hundred coins for the logo, two hundred for Bumblebee, one hundred fifty for Jazz, one hundred for Starscream and Soundwave, fifty for the Ace, thirty for the King or the Queen, and twenty for the Jack or 10. Three symbols along a payline win the player seventy-five coins for the logo, fifty for Bumblebee or Jazz, thirty for Starscream and Soundwave, fifteen for the Ace, ten for the King or the Queen, and five for the Jack or 10.